Did you ever think the strategies you are presently using could be a lot better? Let's face it, most players use the well know "gambling technique" and simply hope to get lucky. Real pros will tell you that "just gambling" doesn't work very well and you always end up losing money in the end. Well, it doesn't have to be that way. In fact, it shouldn't be that way if your goal is to be profitable. What other profession do you know where someone goes to work hoping to do their job well? Aren't they always trained, educated or skilled at their given profession? Shouldn't you be trained and educated as well? While it does not take the place of my pro training programs, it's the next best thing! 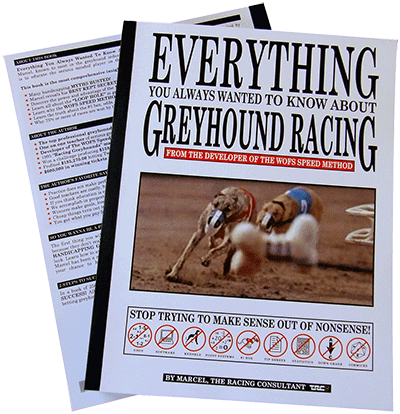 It's also an invaluable tool for the serious minded handicapper and the most comprehensive book ever written! 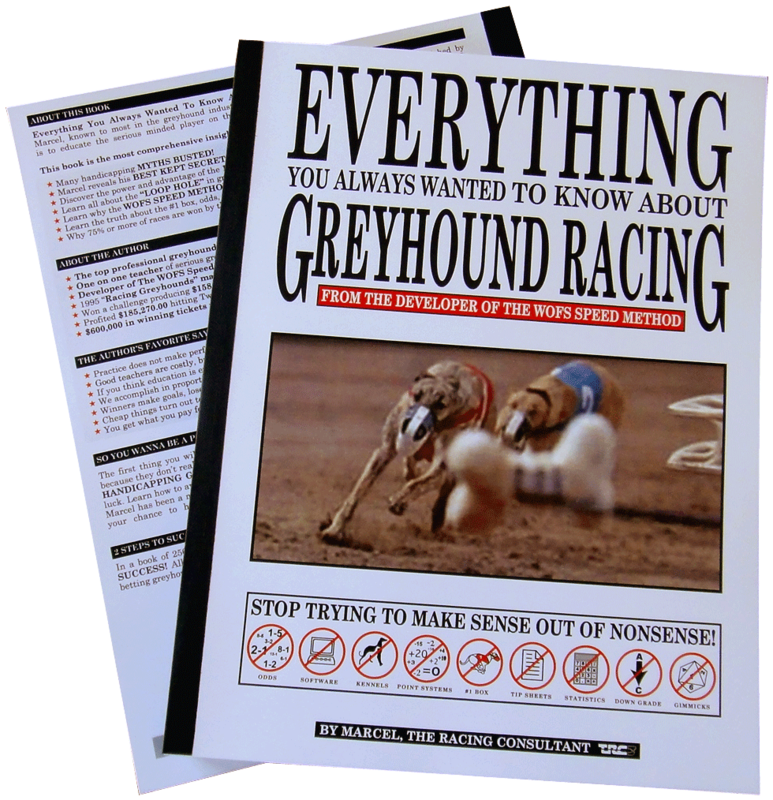 It's also the only book you will ever need to get answers to Everything You Always Wanted To Know About Greyhound Racing. It took one year to complete this book and almost every one of the 250 pages of this unique 8.5 x 11 soft cover book are in COLOR with images, illustrations, charts and graphs. 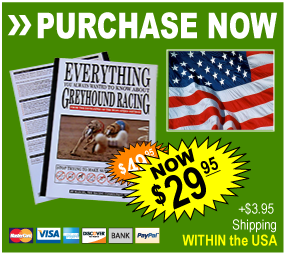 The book has an in-depth analysis on all types of wagering with an emphasis on Trifecta & Superfecta betting. There are multiple in-depth analysis, not the least of which are 6 topics and a total of 30 pages on speed handicapping, showing the power of the 1/8th as it relates to the WOFS Speed Method just to mention 7 of the 239 topics in this book. Discover how my WOFS Speed Method (the only proven handicapping method in the world today) compares with everything else. Start applying new techniques and put the odds in your favor for a change. Remember there are some players playing against you who are actually trained, educated or skilled and these players are ready to take your money. Catch up to them starting today. 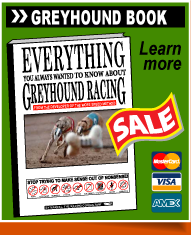 Learn how to avoid all the mistakes and pitfalls so many uneducated gamblers fall into and make greyhound handicapping profitable, not just entertainment. After all, there's no fun in losing! When you know what you're doing you get the kind of benefit and results your time and effort deserves. Thank you for the book. I received it in early December and have read it several times. Let me say I feel like an idiot after reading it because I was a gambler and did some really dumb things. As you said 98% of gamblers lose. I can't wait for the home study course. 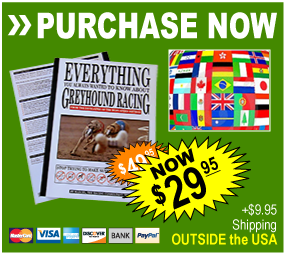 Credit card/Paypal payment: Book ships within 24-48 business hours. Checks/Cashiers check payment: Book ships when check clears.